Colin Martin was a very good athlete indeed. He excelled at events from 880 Yards right up to the marathon and even did his share of the work when Dumbarton AAC set the record for the original Glasgow – Fort William Relay. He was indeed one of the very best club men in the country – the old adage of ‘one man, one club’ held good for his entire career and his club had good reason to be grateful. The same Colin Martin knew how to ‘run wi’ the heid’ as well: I remember a Dunbartonshire 5000m track championship on a very windy afternoon at Scotstoun when the wind really hurtled up the back straight. Colin was up against a much less experienced man that day and when they hit the back straight Colin went to the front with the wind at his back and lured the opposition into working to catch him into the wind up the home straight, he did the same in the second lap, and the third, and by the fourth of the 12 laps he was on his own with the younger runner totally spent! His application for membership of Dumbarton AAC went through on 25th January 1962, he was vice-captain in 1964 and 1965 and was elected captain in 1966. A very popular athlete, his career is reviewed by Colin Youngson. Colin R.L. Martin was born on the 19th of January 1947 and has enjoyed a long and successful career as a middle and long-distance athlete. During all that time, he has been proud to represent only one club: Dumbarton AAC. While other runners of similar ability have worked and raced around Scotland, taking every opportunity to join the most successful clubs available, Colin has stayed true to his roots and his training mates. He may have fewer team medals as a result but has undoubtedly retained his integrity. Colin’s talent was obvious from the start. In 1965 as a Youth he won a bronze medal in the SCCU Championships at Hamilton Racecourse, behind Eddie Knox (Springburn) and John Fairgrieve (EAC). That summer he was fifth in the Junior one mile rankings with a good time of 4 minutes 19.1 seconds. Top of the list for 880 yards and one mile was another fine Dumbarton runner: Graeme Grant. Bill Cairns was another good team-mate. In cross-country Colin did not shine again until 1971, when he finished 19th in the Senior National. For some time after that he took part in the International Training Sessions on Sundays at Cleland Estate, Motherwell, and in November 1971 ran for the SCCU team which lost to the Northern Counties but defeated the Army over mud, hills and a series of nasty brushwood fences at Catterick Camp. In the 1972 National he must have been very pleased with an excellent 11th place (so near to making the Scottish team for the International CC), over a fast course at Currie. In the 1973 National he proved his consistency with 14th place (beating Dave Logue and Jim Dingwall amongst many others) and managed a respectable 24th in 1974. There is no doubt that these four runs in the National would have won him team medals if he had not been admirably loyal to Dumbarton AAC. Colin’s club took part in eleven successive Edinburgh to Glasgow Relays from 1966 to 1975 (plus 1983) and Colin Martin, totally reliable, ran them all. Since he was usually the fastest runner in the club, he was given the responsibility of carrying the baton only against top opposition on Stages 2 (8 times) or 6 (4 times). No chance of shining falsely on the less important legs! Dumbarton’s best placing was tenth in 1969, when Colin gained five places on Stage Two. In 1974 he moved up five once again, this time on Stage Six, finishing an outstanding third-fastest behind Lawrie Reilly and Ron MacDonald. It seems entirely appropriate that, when Colin Martin handed over the baton at the end of Stage Two, in both 1966 and 1983, he passed it to Allan Adams. On the track, Colin Martin raced relentlessly for his club in league races, often running several events in one meeting. Several highlights stand out. In 1969, he was second to John Linaker in the Inter-District 5000m. 1970 was one of his best seasons: 800m 1.55.8; 1500m 3.55.8 when he was fourth in the SAAA Championships (and Commonwealth Games trial) at Meadowbank, plus a win in the West District 1500m; 10,000m 30.39.8; and a debut marathon at Dumbarton in 2.48.55. 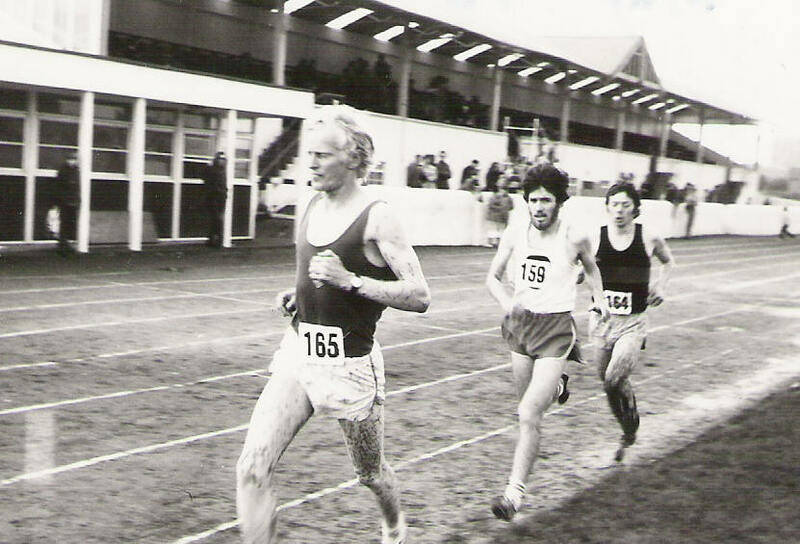 1971 produced the following: 1500m 3.58.3; 3000m 8.23.0; 500m 14.45; and a very good 10,000m in 30.08 when fourth in the SAAA Championships at Meadowbank. By 1972, Colin had become one of my main rivals. He was undoubtedly faster but I was gaining in stamina. Two races illustrate this. At Meadowbank on the 27th of May, we both had a go at the SAAA Ten Mile Track Championship. EAC’s Andy McKean went off with Colin in close attendance but then dropped him before going on to win easily. My training diary states: “Caught CM at three miles after a big effort and then we took two laps each until I made a break at seven miles and struggled to the finish. Andy 49.25, me 50.15, Colin 50.45.” However by the 16th of September Colin Martin was much fitter. In the afternoon at the Grangemouth so-called Highland Games, he sprinted away in the 3000m to produce a PB of 8.21.4, five seconds clear of me and young Lawrie Spence. According to the SATS Yearbook, that evening at Meadowbank in a 5000m, Colin set another PB in a time of 14.18.0. As I said, a hard man! 1974 seems to have been Colin’s last serious track season. He won the West District 5000m at Grangemouth on 25th May, defeating Phil Dolan of Clydesdale Harriers. His other races were at Meadowbank: victory in a 1500m on the 8th of June, recording 3.57.3; at the SAAA Championships on 22nd June he ran 14.22 for 5000m; and in July completed 10,000m in 30.21.4. Apart from his E to G runs, Colin Martin had shown considerable promise as a road racer. For example in the Glasgow University Road Race (over five and a quarter miles) he was third in both 1971 and 1972. In March 1973 he was third in the Balloch to Clydebank 12 and a half (behind Jim Dingwall and me) but then in early June won easily in the Airdrie 13. I believe that he went on to run for Scotland against Northern Ireland in another road race around half-marathon distance. It was not surprising that Colin eventually turned to the marathon as his main event. In 1978 he improved his best to 2.38.13 in the SAAA event. 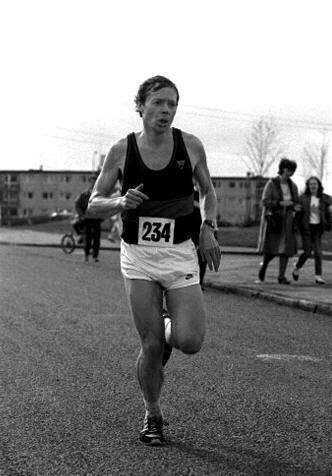 A particularly good run was in the 1981 Glasgow Marathon, when Colin finished fourteenth in 2.28.25. A year later in the same event he recorded 2.30.36. Then in April 1984 he won the inaugural Lochaber Marathon in 2.28.36, improving this record with another victory in 1985 with 2.26.58. However the best win was yet to come. The History of the Scottish Marathon Championship tells the following tale. “1988 was the year when the SAAA Marathon travelled to Fort William as part of the (still flourishing) Lochaber Marathon. 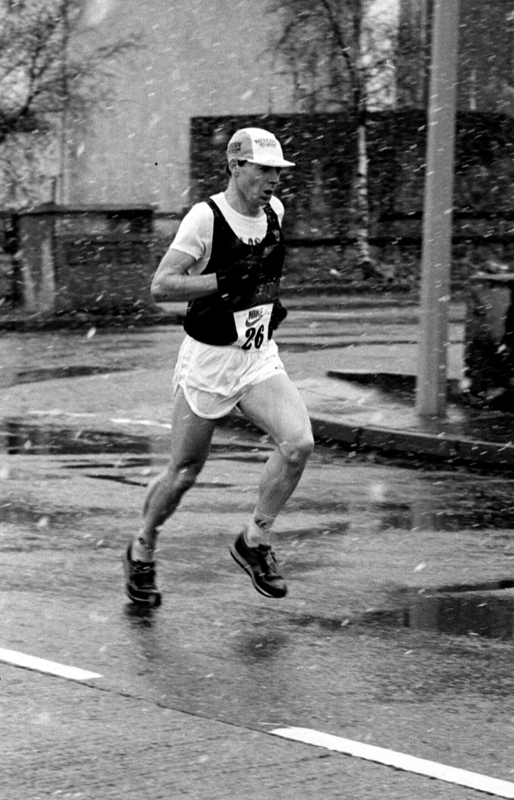 Colin Martin, a Scottish Road-Running International in the seventies, had become a veteran the previous year. He and his Dumbarton training friend/rival Allan Adams (a British Veterans Marathon Champion) had been doing 90 to 100 miles per week, with Tuesdays and Thursdays devoted to 400, 800 or even mile repetitions with Lachie Stewart and his promising son Glen. Colin’s Saturday session might be 22 miles on the road, with Sundays an hour and a half over country trails. Lochaber made an excellent target, since it also hosted the Scottish Veterans and SAAA events. Donald Ritchie, the famous ultra-distance runner, wrote that on 24th April “a group of six runners formed by the time we left town. I increased the pace and by the turn there were three of us left. At about 18 miles I managed to drop the Pitreavie runner McNeill, but Colin Martin stuck behind me.” Colin himself remembers that over the next few miles, both athletes made attempts to get rid of each other, to no avail. Shortly after the right turn at Corpach, over a steep little climb starting at a garage, Colin burst away and held a narrow lead to the end. It was a very gruelling race indeed. 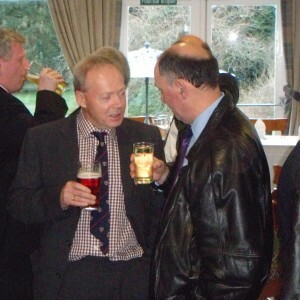 Colin Martin and Doug Gunstone at a Reunion Dinner in April 2012.